Lina's Kusina Cafe in Glebe is great place to dip your toe into Filipino cuisine. They have a modern easy-eating style of cooking and super friendly service. And if you're dragging along non-adventurous eaters there's also western style sandwiches and stuff, though try to talk them into the Chicken inihaw, they can even have it with chips. Lina's Kusina is in the tiny spot previously home to COV Tastes of Taiwan. And when we say tiny we mean tiny, about the size of Richard Wilkin's walk-in wardrobe. There's enough room for maybe a dozen punters, it really is a hole-in-the-wall, yet the service is surprisingly fancy. The boss lady tells us they are starting out small and hoping to build up and move onto bigger premises later. We certainly hope it works out because we sure do like their cooking. 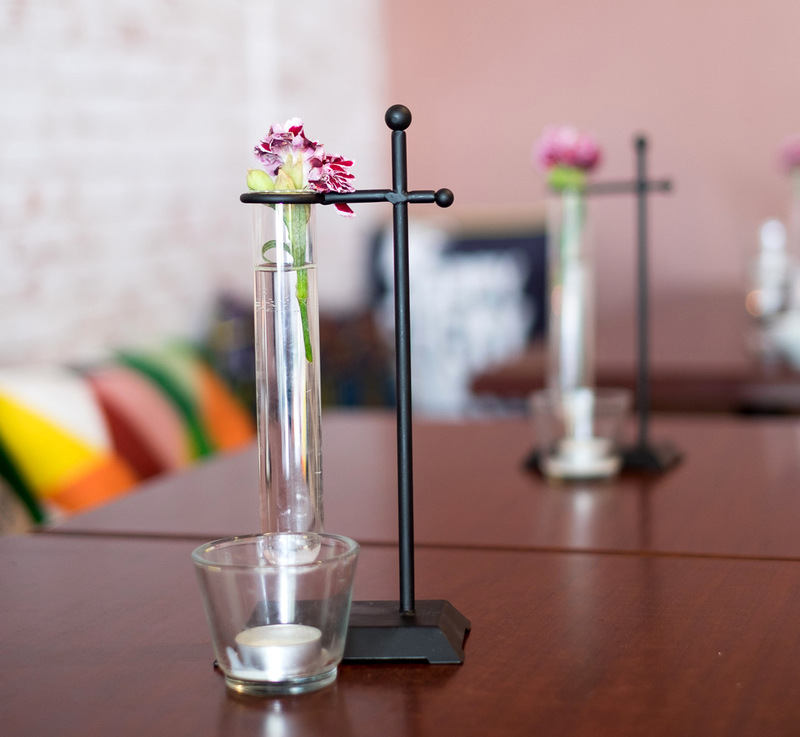 We've visited several times and still have a bunch of dishes on our wish list. We ordered the tofu sisig ($8.90) out of curiosity, we love it's carnivorous porky cousin but didn't have great hopes for the vego version. 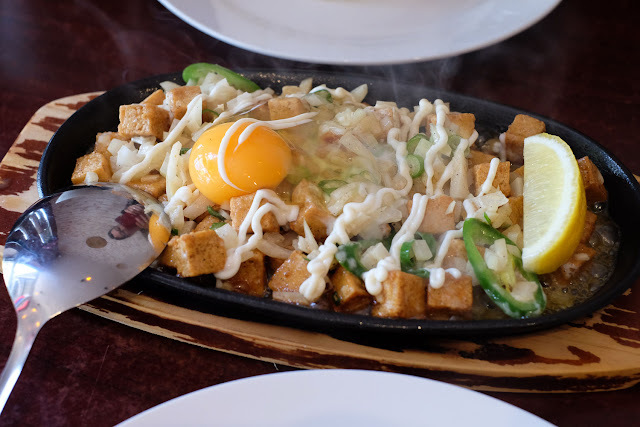 How wrong we were - it's sensational - crispy fried cubes of firm tofu served sizzling in oil with onion, mayo, a little chili and an optional egg to stir in. The chef really nails this baby. 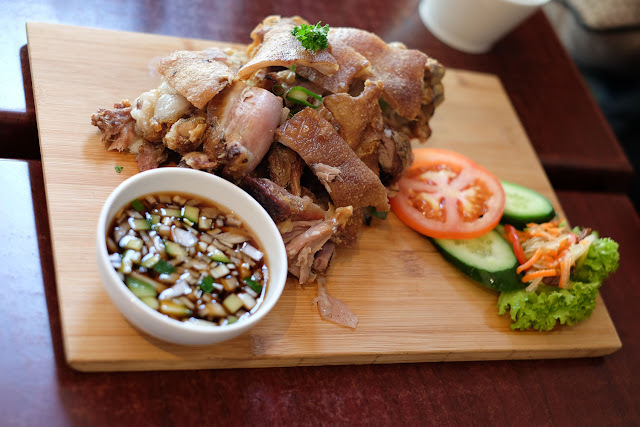 Crispy pata ($18) is always an easy bet for pork fiends - deep front pork knuckled with crunchy crackling for naughty girls and boys, and several good hunks of meaty flesh. It's rich and lardy, best shared. On every visit we've been offered a welcoming little bowl of beef or chicken broth is served gratis. We told you the service was schmancy. Lina's is one of the very few, if any, places that do Filipino breakfasts in the inner west, all day too. 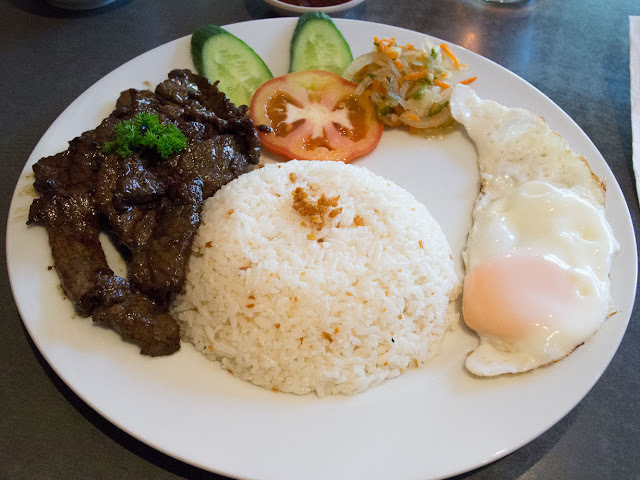 This is the tapsilog ($10.80) - stir fried marinated beef with garlic rice, googie and with a little pickled veg for zing. The cornedsilog ($9.80) is same-same the tapsilog but replaces beef with pulled corned beef sauteed in onion. Other versions include cured pork, sausage, milkfish and hotdog - yes kids, hot dogs for breakfast! Another super easy to recommend dish is the chicken inihaw ($11.90). Grilled chicken with rice (or chips!). This is a top-notch piece of chook. A large maryland piece grilled until a little crisp, still moist and soft inside. We've had this dish a couple of times, it's awesome, very easy to recommend. Chicken mami - $9.50. 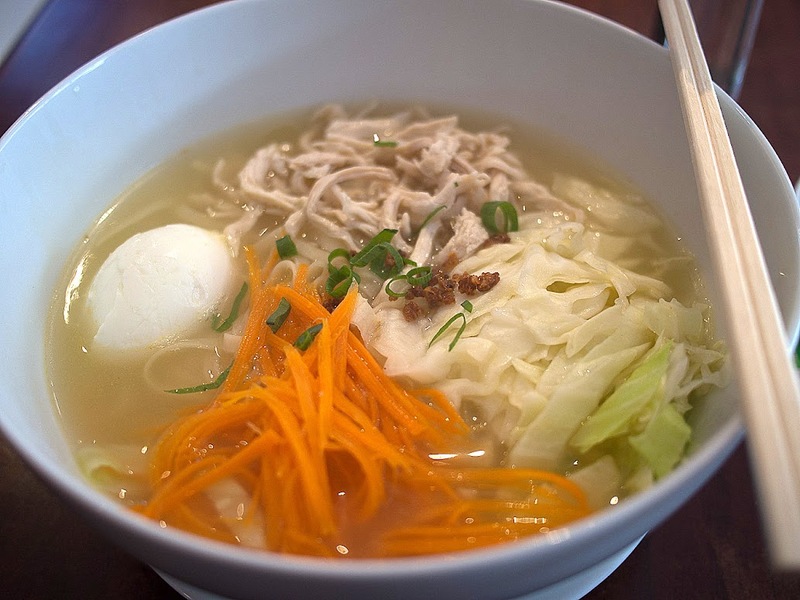 A good noodle soup, though not a great one, certainly one we'll come back for when we feel like a big bowl of light, clean chicken broth. Comes with noodles, googie, shredded chicken and veggies. Beef mami soup - $9.80. Like the chicken mami, only with cow. Again, an ok noodle soup if you're busting for it, but not a beauty.